The NBC Bay Area Investigative Unit has found a single master key grants access to gas pumps across the state and it’s giving easy access to thieves looking to compromise Bay Area drivers’ credit card information. Call it the key to the kingdom. In the world of gas pumps, there is a universal key unlocking a lucrative business for identity thieves. 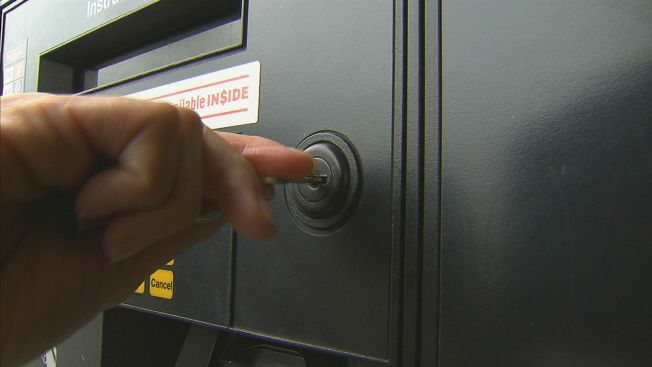 The NBC Bay Area Investigative Unit has learned a single key opens the majority of gas station pumps across the country, making it easy for crooks to install high-tech skimming devices and resulting in hundreds of victims of credit card fraud in the South Bay. The single key was initially created to make it easier for pump inspections and maintenance, but now, copies are circulating amongst thieves. The Rapid Enforcement Allied Computer Team, a high tech task force of investigators in Silicon Valley, which partners with the Santa Clara County District Attorney's Office, is looking into hundreds of these cases across the state. The REACT Task Force has uncovered nine skimming devices in the past two months from Bay Area gas stations. Three hundred victims have been identified so far and that number continues to grow. “We are just touching the tip of the iceberg,” REACT Task Force Director Mike Sterner told NBC Bay Area. Sterner, who is also an investigator with the Santa Clara County DA, says the crooks use the key to get into the pumps. He says they are installing new Bluetooth-enabled skimming devices. The Bluetooth technology collects the data from credit cards then transmits that information up to 100 yards away to the thieves. And it all happens in a matter of seconds, while unsuspecting drivers fill up their gas tanks. The crooks never have to return to the pump to retrieve the device. Plus, it's nearly impossible for a customer to tell the device is installed. “It is virtually undetectable,” Sterner told NBC Bay Area. He estimates consumer losses in the millions of dollars. There is a quick fix according to Sterner: Change the locks. We found one of those gas station owners in Santa Clara. Police say they advised Valero owner Ed Soltanzad to change his locks, after they found two Bluetooth skimmers in his pumps last month. The locks remained and weeks later, police found two more skimmers. They don’t yet know how many people had their credit card information stolen. Soltanzad did not return NBC Bay Area's calls requesting an interview. The Investigative Unit met up with him at his station to ask about his locks, but he walked away from the camera, locking himself in his office. He said through the office door that he has ordered new locks but they have not yet arrived. Another station owner, Gerard Habib, already has taken steps to protect customers. “It’s a concern that our customers would be cheated out of their hard earned money. So if we can do something to prevent that from happening, by all means we are going to do that,” Habib said. Habib owns a San Jose Chevron station that services 6,000 cars a day. He says he changed his locks immediately after police found a Bluetooth skimmer in one of his pumps last month. “That’s crazy, isn’t it? All over the country and a couple of keys that open every gas station pump,” Habib said. He said it cost him about $1,000 to get the new locks. While the cost may hinder some station owners, police say there are cheaper options, like security tape. When the tape is broken, it shows someone has tampered with it. When it comes to gas station ownership and who’s responsible for gas pump security, there are three types: independently owned stations, company owned stations, and franchises. NBC Bay Area reached out to several major gas companies to see what policies they have in place to foster pump security. Valero said the majority of their stations, like the one in Santa Clara, are independently owned and the company does not dictate security measures, but at Valero-owned stations, it provides enhanced security. The spokesperson would not give specific details. Chevron said requires dispensers to be inspected daily for skimming devices and encourages this policy at independent and franchised sites. Phillips 66 provides fuel to 76 stations. While the company does not own any California stations, it does assist in the cost of upgrading pump locks and also provides materials and training for upgrades. Shell also works with wholesalers to provide incentives to change locks. The company said it encourages station owners to use security tape and is working on new alarm technology to prevent fraud. While many credit card companies will cover the cost of fraud, Sterner says they pass their rising costs onto consumers in the form of higher interest rates. To protect yourself, look for stations that have updated security and advanced locks. Ask the owner at your gas station if they use the universal lock system. And when in doubt, pay inside.